Palmer’s Cocoa Butter Skin Therapy Lotion provides the skin with 24 hours of moisture to keep skin feeling soft and moisturized. The skin lotion promotes new and healthy skin cell turnover to leave the skin smooth and silky while it helps the skin to be rejuvenated. 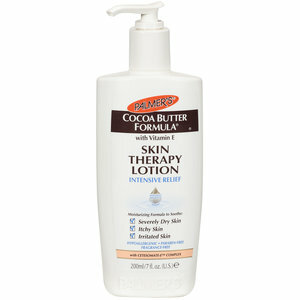 This Palmer’s Cocoa Butter Skin Therapy calms and soothes itchy and dry skin. Alpha hydroxy acids gently exfoliate flaky patches of skin to reduce skin itching while promoting the healthy skin underneath. Palmer’s Cocoa Butter Skin Therapy Lotion has been tested by dermatologists and adds relief for many irritated skin conditions while still being sensitive enough for use on many areas of the body. The moisturizer has a non-greasy formula to treat dry skin of the body without the feeling of residue on your skin.